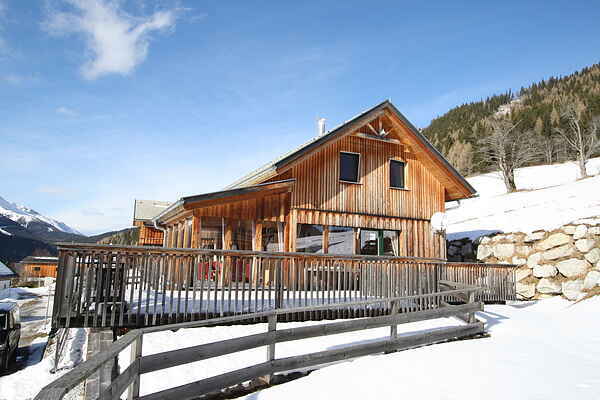 This chalet is located in a family-friendly holiday village with cosy log cabins on a sunny slope, surrounded by beautiful mountains in the middle of the Hohentauern area at an altitude of 1250 meters. Discover this sports village: whether you are with family, friends, hikers or mountaineers, everyone will find something they enjoy in Hohentauern. The holiday village is located right next to the ski slope about 100 meters from the lift to the ski resort of Hohentauern. A cross-country ski run is about 200 meters away, and the centre is about 2 km away. The Hohentauern ski and winter area is a secret tip for families and connoisseurs who love delicious natural slopes in a friendly atmosphere. It's a small yet splendid skiing paradise! Those who enjoy other winter sports, such as hiking, cross-country skiing, and snowshoeing, will love it here as well, amidst the gorgeous natural setting and peaceful winter landscape. You can do all activities directly from the holiday village, so you can leave the car parked! The wooden chalet is warmly and comfortably decorated. Sandwich service is also available on request. In the winter, Styria transforms into the "white heart of Austria", with its wonderful ski resorts. In summer, the region is popular for its many lakes, spas and the impressive Hohe Tauern mountain range. More than 200 sunny days per year and a skiing area with snow guaranteed make this a perfect holiday destination for all seasons. Please note! During the next period, 25 new houses will be built in the park; please bear in mind that this might cause some inconvenience.